If you are like any other person who enjoys frequently cooking, you probably have a few draws or cabinets filled with pots and pans. You also probably have a drawer full of different sized lids that do not have a matching pot or pan to it. If you are more of a baker, your glass bake ware might be completely disorganized to the point where you cannot find the one you want when you really need it. There are solutions for all of these problems. You no longer have to search the entire kitchen for that one pot, that one baking dish or that missing lid. The first task to tackle is to organize your lids that belong to your pots and pans. There are small rails you can screw into the doors of your cabinets. This lets your lids rest easily against the rail so they are readily available to you when you open your cabinet door. This technique also helps clear space from other areas in your kitchen. You no longer have to designate one drawer or cabinet for your lids. You can install these rails on every cabinet and store your lids all over your kitchen. The best thing about these rails is they fit all sized lids. Whether the lid is for a small frying pan or a large cooking pot, they will fit side by side on these rails. If you are someone who likes to keep your lids with the corresponding pot or pan, this next trick is for you. In your pull out drawers you can install wooden dividers to make individual compartments. These compartments can be individualized for each pot so they fit perfectly. You can store your pots and pans with their matching lid in one drawer so you will never get the two separated. These dividers do not have to be fancy and expensive. A simple piece of particle board would be sufficient enough to separate the different pots and pans from each other. Another way to keep the pots with the lids is to invest in a tree cookware organizer. This will hold four different sized pots with their matching lids in the shape of a tree. You only need to designate one cabinet space for this product and you will be able to store up to 8 different pots and pans. Along with storing the pots in the tree shape, there are some hooks on the corners so you can easily hang some pans by their handles. Some cooks don’t use lids or don’t bother keeping them stored together at least. If this is you, you should look into installing some hooks on the underside of your counter in your cabinets. 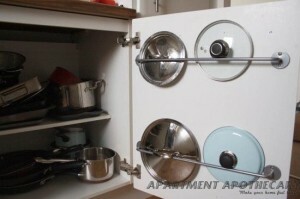 This is a cheap and easy way to store your expensive and fancy cooking pots and pans. You can hang these items by their handles so they are suspended in the air and not touching any part of the cabinets. If you have the lids available, you can store them under the pots to keep them in the same vicinity. These hooks can be found at just about any department store or hardware store. 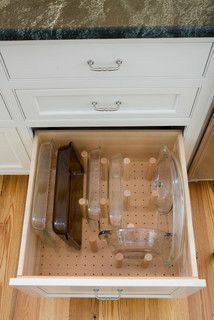 You don’t want to forget about your glass cooking dishes when it comes to organizing your kitchen. These are some of the most important accessori es in anyone’s kitchen. They can be used for baking cakes, cooking casseroles and many other things. The first thing to do is place a piece of peg board in the bottom of any drawer. This gives you the freedom to design a space to store your glassware as you see fit. You can place the pegs in different patterns to hold your items depending on the size of the dish. You will be able to easily store your large cake pan, your small bread pan and even your round pie dishes all in the same drawer. Using these ideas will turn any ordinary kitchen into an organized and trendy kitchen. Don’t spend any more time searching for your pots and pans and their matching lids. You will now know exactly where every item is and able to create your dishes in no time.